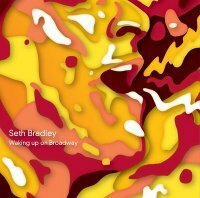 Tonight head on over to The Cubby Bear Wrigleyville for the release of local recording artist Seth Bradley’s newest album, Waking Up On Broadway. Seth and the band have been hard at work recording at the CRC (Chicago Recording Company) for the past few months and piecing the album together, so come out and be the first to get your hands on the highly anticipated CD! Seth’s smooth vocals, heartfelt lyrics and pop rock style make this an album that definitely speaks (or sings) to the masses. Waking Up On Broadway is Seth’s second EP release and revolves around “A New Beginning” for the singer with tracks like:Fall On Me, Chasing The Habit, Breaking Away and Stars on the Ceiling. Things are expected to kick off around 9:30 and for only $7 at the door, there’s a great lineup in store for the CD release celebration. Seth Bradley, How Far To Austin, MER and Clark Richard will all be taking the stage and if you Click Here, you can save an additional $2 at the door. Hand the flyers out to friends, family, coworkers, etc. . The person who has the most people show up with the flyers with their name on it wins a guitar autographed by Seth Bradley himself. Doors open around 9:30, Seth takes the stage at 11:15. Get out, do some promoting, hear some great music, win a guitar and call it a night! The Cubby Bear Wrigleyville, 1059 W. Addison on the corner of Clark and Addison across from Wrigley Field.